Today was Day #3 of Chocolate and Almond Theme Week. The history of the almond began in the Middle East and South Asia, and spread to temperate climates worldwide. 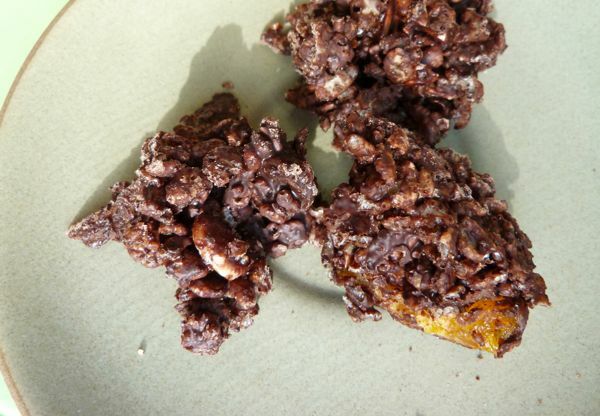 California (where I live) produces tons of the popular nut each year in the U.S. Cacao beans used to make chocolate come from tropical climates. So, as with many flavored chocolates, several interesting and internationally inspired flavor blends were possible today that incorporated these two ingredients. 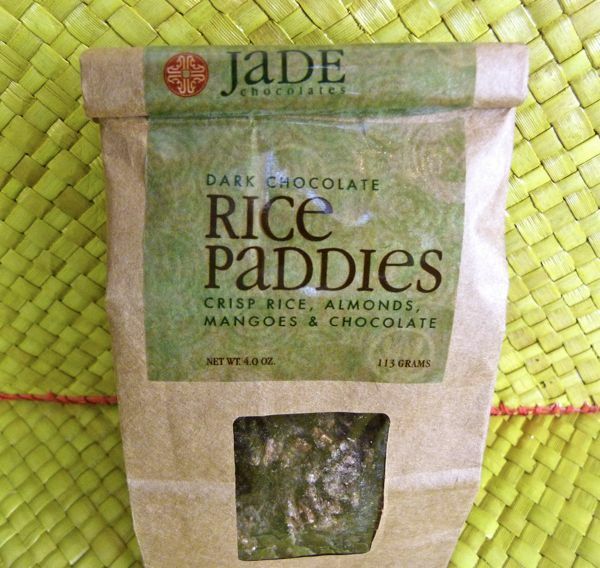 Mindy Fong, at Jade Chocolates (San Francisco, CA), produces chocolates with interesting fusions of flavors from east and west, often artfully incorporating favorite specialty ingredients, such as tea, rice or mangoes. 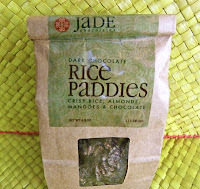 Today's Dark Chocolate Rice Paddies, contained crisp rice (note to those watching gluten intake, these contained malt flavoring), roasted almonds and pieces of bright, tangy dried mango. 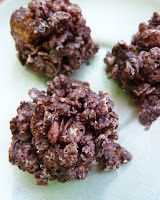 Dark chocolate helped bind these ingredients into small mounded patty shapes. If you're looking for a healthy, exotic take on crispy rice treats with dark chocolate, these Dark Chocolate Rice Paddies are a great bet. Merry Christmas Eve to all who celebrate, and to those who await the coming of Santa Claus.